Epic poems telling of cultures colliding, deeply conflicted identities and a fast-changing world were written by the Greeks under Roman rule in the first to the sixth centuries CE. Now, the first comprehensive study of these vast, complex texts is casting new light on the era that saw the dawn of Western modernity. Maybe it was the language, architecture, codified legal system, regulated economy, military discipline – or maybe it really was public safety and aqueducts. Whatever the Romans did for us, their reputation as a civilising force who brought order to the western world has, in the public imagination, stood the test of time remarkably well. It is especially strong for an Empire that has been battered by close historical scrutiny for almost 2,000 years. So perhaps another way to characterise the Roman Empire is as one of cultures colliding – a swirling melting pot of ideas and beliefs from which concepts that would define western civilisation took form. This is certainly closer to the view of Tim Whitmarsh, the A. G. Leventis Professor of Greek Culture at Cambridge, who is the principal investigator on a project that has examined Greek epic poetry during this period. His interest in the Greek experience stems partly from the fact that few cultures under Roman rule can have felt more keenly the fissure it wrought between present and past. In political terms, Ancient Greek history arguably climaxed with the empires established in the aftermath of the conquests of Alexander the Great (356–323 BCE). In the period when this poetry was written, from the first to the sixth centuries CE, the Greek world had been annexed by the Romans. Yet the relationship between the two cultures was ambiguous. Greek-speaking peoples were subordinate in one sense, but their language continued to dominate the eastern Empire – increasingly so as it became a separate entity centred on Byzantium, as Christianity emerged and as the Latin-speaking west declined. Greek remained the primary medium of cultural transmission through which these changes were expressed. Greek communities therefore found themselves linked closely to their past, while also coming to terms with a fast-metamorphosing future. Epic poetry, which many associate with Homer’s tales of heroic adventure, seems an odd choice of lens through which to examine the transformation. Whitmarsh thinks its purpose has been misunderstood. It is perhaps the most important tool available for understanding how the Greeks navigated their loss of autonomy under the Romans and during the subsequent rise of Christianity. In recent years, such questions have provoked a surge of interest in Greek literature during that time, but epic poetry itself has largely been overlooked, perhaps because it involved large, complex texts around which it is difficult to construct a narrative. Funded by the Arts and Humanities Research Council, Whitmarsh and his collaborators set out to systematically analyse the poetry and its cultural history for the first time. “We would argue it’s the greatest gap in ancient cultural studies – one of the last uncharted territories of Greek literature,” he adds. The final outputs will include books and an edited collection of the poems themselves, but the team started simply by establishing “what was out there”. Astonishingly, they uncovered evidence of about a thousand texts. Some remain only as names, others exist in fragments; yet more are vast epics that survive intact. Together, they show how the Greeks were rethinking their identity, both in the context of the time, and that of their own past and its cultural legacy. A case in point is Quintus of Smyrna, author of the Posthomerica – a deceptive title since chronologically it fills the gap between Homer’s Iliad and Odyssey, even though it was written later. Quintus’ style was almost uber-Homeric, elaborately crafted to create an almost seamless connection with the past. Yet there is evidence that, having done so, he also deliberately disrupted it. “His use of similes is quite outrageous by Homer’s standards, for example,” Whitmarsh says. The reason could be Quintus’ painful awareness of a tension between the Homeric past and his own present. Conflicted identity is a theme that connects many poems of the period. The poet Oppian, for instance, who wrote an epic on fish and fishing, provides us with an excellent example of how his generation was seeking to reconceive Greek selfhood in the shadow of Rome. The work ostensibly praises the Emperor as master over land and sea – a very Roman formula. Oppian then sabotages his own proclamation by questioning whether anyone truly can command the sea’s depths, a feat that must surely be a journey of the intellect and imagination. Having acknowledged the Emperor’s political power, he was, in effect, implying that the Greeks were perhaps greater masters of knowledge. The researchers expected to find that this tension gave way to a clearer, moralistic tone, with the rise of Christianity. Instead, they found it persisted. Nonnus of Panopolis, for example, wrote 21 books paraphrasing the Gospel of St John, but not, it would seem, from pure devotion, since he also wrote 48 freewheeling stories about the Greek god Dionysus. Collectively, this vast assemblage evokes parallels between the two, not least because resurrection themes emerge from both. Nonnus also made much of the son of God’s knack for turning water into wine – a subject that similarly links him to Dionysus, god of winemaking. Beyond Greek identity itself, the poetry hints at shifting ideas about knowledge and human nature. Oppian’s poetic guide to fishing, for instance, is in fact much more. “I suspect most fishermen and fisherwomen know how to catch fish without reading a Greek epic poem,” Whitmarsh observes. In fact, the poem was as much about deliberately stretching the language conventionally used to describe aquaculture, and through it blurring the boundaries between the human and non-human worlds. Far from just telling stories, then, these epic poems show how, in an era of deeply conflicted identities, Greek communities tried to reorganise their sense of themselves and their place in the world, and give this sense a basis for future generations. Thanks to Whitmarsh and his team, they can now be read, as they were meant to be, on such terms. 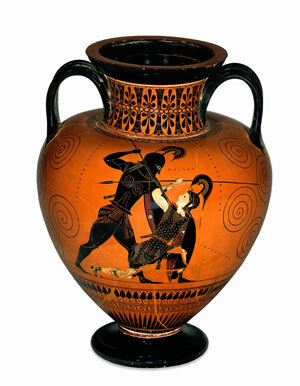 Inset image: Wine jar made in Athens around 535 BC. © The Trustees of the British Museum.